Here's the kind of record I love. From the early 1960s, a great small combo of guitar, piano, organ, tenor sax, bass and drums playing movie and television themes. 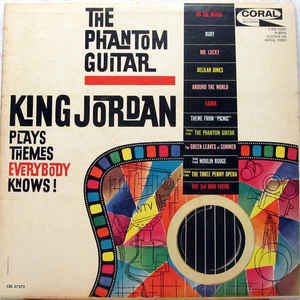 It's King Jordan: The Phantom Guitar and the 504th Soundtrack of the Week. The phantom guitarist himself is actually ace session musician Bob Bain, who's played on zillions of soundtrack recordings and other dates. With him here are the unmistakable Plas Johnson on tenor, bassist Joe Mondragon, drummer Frank Flynn, pianist Don Trenner and Paul Smith on Hammond organ. It's a swinging record, laidback and extremely pleasant. Bain's guitar tone throughout is beautiful and Johnson's saxophone is mellifluous, tasteful and inventive as always. It's an intriguing set of tunes. It's not surprising to see pieces like the theme from Mr. Lucky, "The Green Leaves of Summer", or the "Third Man Theme" but it's less expected to see music from The Man with the Golden Arm and Ruby Gentry. There's also one original, "Theme from the Phantom Guitar", which has a dreamy and exotic feel to it. It's wonderful to have this on CD. Available from CD Baby!